winner chosen by random.org and announced on tuesday. I pinned that mustard ipad case ages ago and still love it just as much now. Love the blog. Its so inspiring. My favorite item in the Aubrey Plays shop is the embroidered bicycle Nook cover! um that typewriter pillow is adorable. I love that messenger bag! Perfect for college! Love that bag! Thanks for the giveaway! I love the Market Tote,Sassy Errand Bag....perfect colors! How adorable!!! What a fantastic giveaway!! I love her sewing girl orange fat quarter!!! That is SO cute!! I adore Aubrey and her shop! And I love the bright and cheerful bag! My favorite items are always changing , but, today it is the Secret Garden phone clutch. I like Aubrey Plays on facebook! I follow Aubrey on twitter. I love love LOVE the typewriter pillow. How cute is that?! Oh My! All her things are so cute, but if I had to pick my favorite it would be the "baby bee" for my daughter. She would love that! I now follow her blog! Thanks for hosting, Aubrey's things are adorable! That bag is so inspiring! So much cuteness! I love the Let Your Light Shine pillow! New follower on her blog via Google reader & PS love this giveaway bag! cutified! 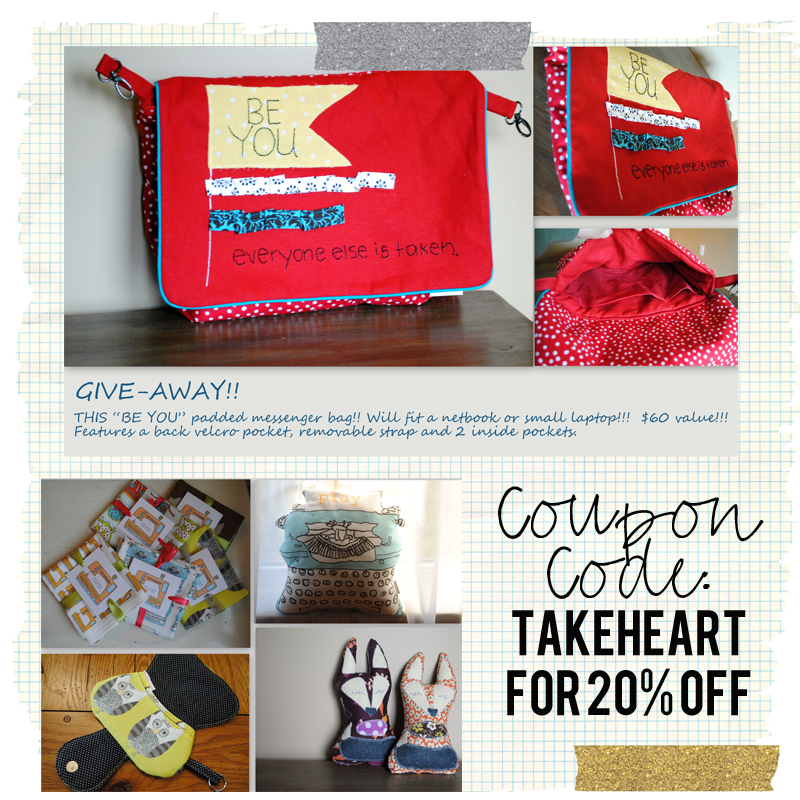 cute blog you have---and love this giveaway! i love the quote on the bag! my favorite is the day dream clutch! 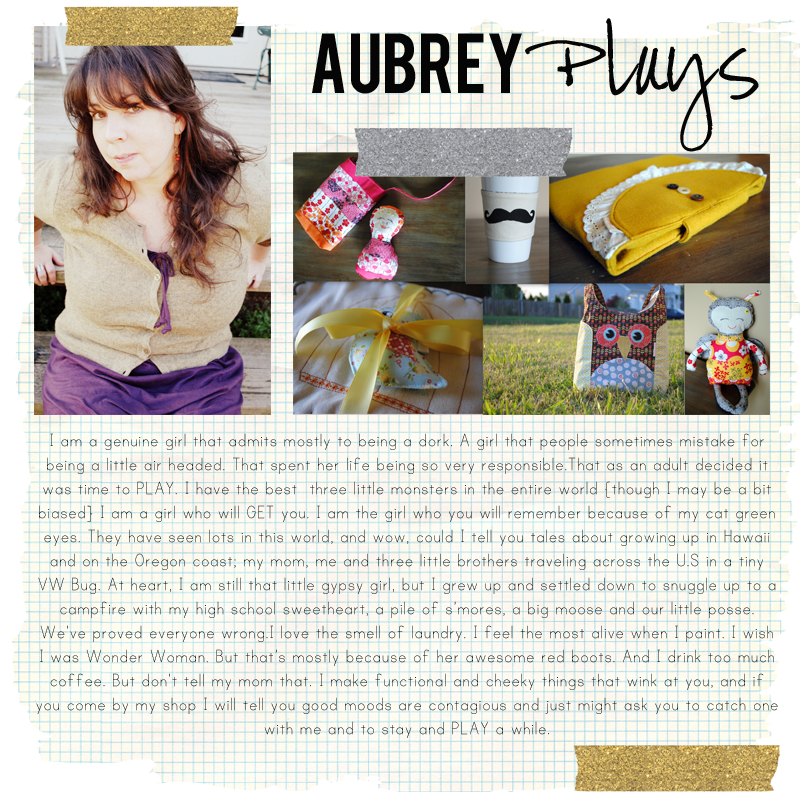 i liked aubrey plays on fb! Aw, I love that sentiment! Thanks for offering this giveaway! ahhh! such a cute bag! 'favorited' an item on etsy. That "unique" purse! Love the turquoise and orange with the black and white. I like the happy chevron quilted canvas! I love that quote...it's just so true! i love everything!! the kindle covers are perfect!! I LIKE her on FB!!!!!! !